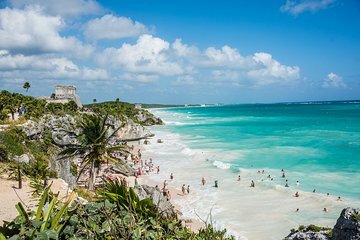 Set yourself apart from the crowds on this private tour to the Tulum ruins from Cancun. Your guide personalizes your experience to suit your interests and schedule, but all tours include a guide, transportation, and entrance fees, plus the option to add on stops like snorkeling, ziplines, or lunch. Without a set itinerary, you're free to explore the area how you want. Get early start on the day with pick-up between 6:45 AM or 7:30 AM from your Hotel in Cancun or the Riviera Maya,then board a private vehicle.